Adolescence is a time of thoroughgoing transformation, both at the physical level and at the psychological and moral level. During this delicate transition period, the young person needs to be led to understand the role he or she is going to play as an adult in society. Young people are at this time impelled by a new inner force which clamors for logic; they need to be offered specific goals which not only provide immediate satisfaction in their work, but also help to sustain their motivation to keep on striving. Maria Montessori considered that “…it is at this time that the sense of justice and of personal dignity should develop : a human being’s noblest features, which mold him into a social being” (From childhood to adolescence). The Montessori teaching program does not extend to pupils beyond 12-13 years of age, save in a few boarding schools in the world. 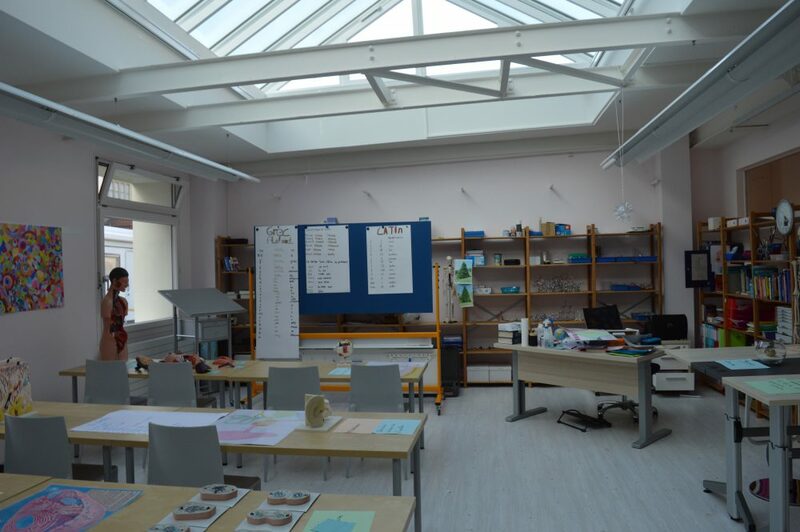 However, in order to enable our students to continue their schooling in a similar pedagogic spirit, we have worked out a program up to the age of 16 by combining Montessori-type teaching with a more traditional educational approach. The program extends over four years and enables the young people to either go on with further academic studies or to follow whatever professional training they need for their future occupation. The main courses are French, maths, geometry, English, German, history and geography ; however, the aim of the program is to be comprehensive so as to provide a sound and diversified cultural grounding. The four-year curriculum includes Latin, Greek, physics, chemistry, biology, anatomy, meteorology, climatology, political and economic geography, philosophy, art history and theater improvisation. The fine arts also hold a prominent place, with classes in drawing, painting and music. In the sciences, lectures are supplemented by laboratory experiments. In some of the courses, there are regularly organized visits for a practical illustration of the subject under study. In order to supplement and enhance their theoretical understanding of a given subject, the students are often required to do a piece of research and to present their results orally and in writing. The regular schedule includes classroom study time under the supervision of a teacher in order to help students to organize their work and to discover and work out the most efficient and rational learning methods. Tests are given on a regular basis and the marks help the students to keep track of their academic progress. This leads them to gradually acquire autonomy in the way they organize their studies. A final examination takes place the end of each of the four years ; thus, the students become accustomed and develop self-confidence in this type of situation.